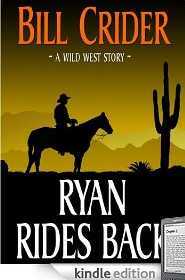 PAUL BISHOP ~ WRITER: WESTERN PULP: RYAN RIDES BACK! WESTERN PULP: RYAN RIDES BACK! Bill Kane was going to hang for murdering Ryan's sister... After three long years, folks were shocked Ryan would show his face after abandoning his sister to her bloody fate. Others were amazed - and frightened - that he was back at all. No man could have survived that night in Shatter's Grove. But Ryan was no ordinary man, and Tularosa was in for more shocks and surprises, because Ryan was back for justice - and the real truth behind his sister's betrayal and murder.